L’idiot has been on my list of restaurants to try, after watching the movie My Egg Boy (see the trailer here). Trust me, watch the movie and you will understand why. Just fast forward through all the parts about the figurative eggs, and focus on the fabulous produce and cooking… and the person that does the cooking. Currently the restaurant has moved from the original location in Ming Sheng community, to the first floor of the Gloria Prince Hotel, in Zhongshan District. 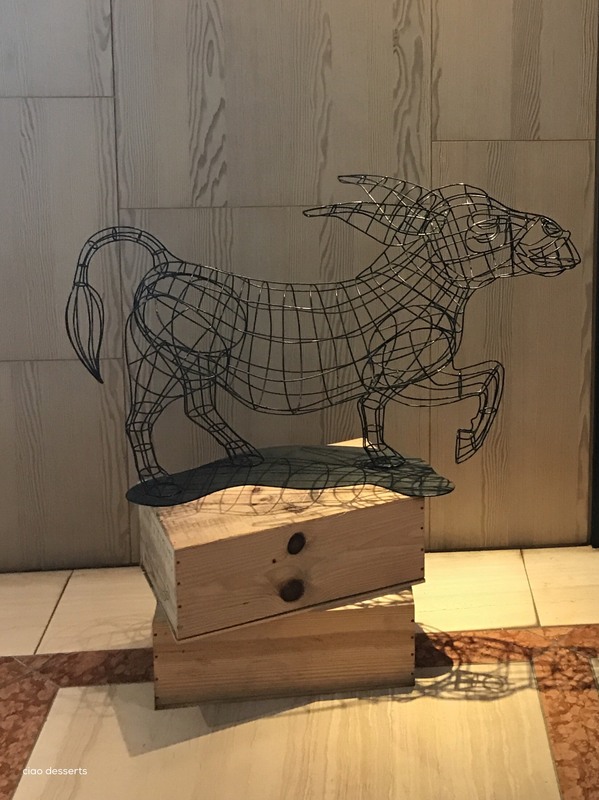 Once you enter through the front doors to the hotel lobby, the restaurant is easy to spot~ there is a wire donkey statue right by the front door. (I recommend making reservations~ especially for lunch because it was full even on a weekday). Since the restaurant was pretty busy, it was hard to get a clear photo of the interior, without getting in the way. I took a quick glance around and found the decor to be a fun mix of quirky items. My friend and I both ordered the lunch set, (at $599 + $70 choice of sparkling or still water, and 10% service charge) and that includes salad, bread, soup, a main dish, dessert and coffee. The bread arrived first, it was served warm, alongside a creamy rich and slightly sweet ricotta spread. The salad followed soon after the bread~ I ordered the garden salad (農場沙拉） which is made from the vegetables grown on their farm, located in the outskirts of Taipei. 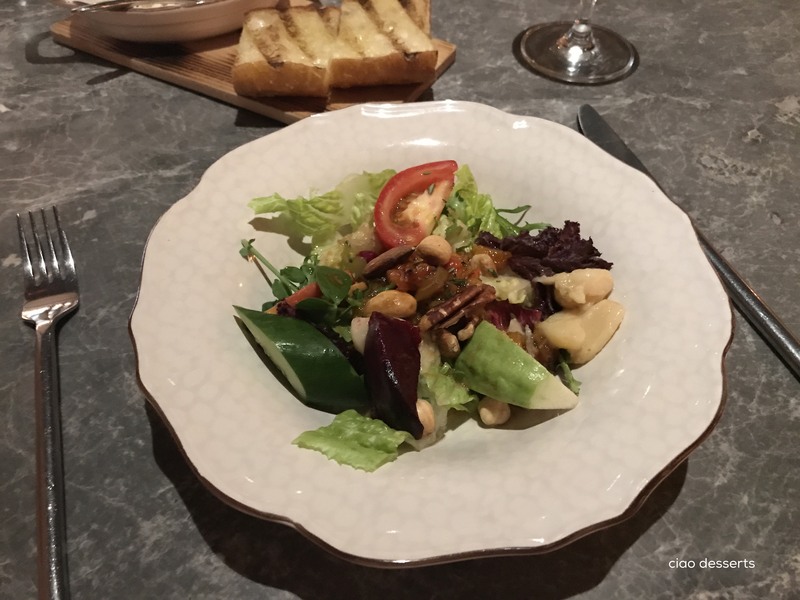 I love a creative salad that is built from a different variety of ingredients~ this one had a couple different types of greens, tomatoes, pickled ginseng, turnip, cucumbers, assorted nuts, roasted garlic and slices of guava. So flavorful! Why rave so much about a salad? Because salads are often a hit-or-miss in Taiwan… so it feels like Christmas if you are served a really delicious one. (If you want to see an example of a complete miss, see my Instagram post from a recent lunch here). The salad and bread were followed by their soup of the day, which happened to be tomato soup. 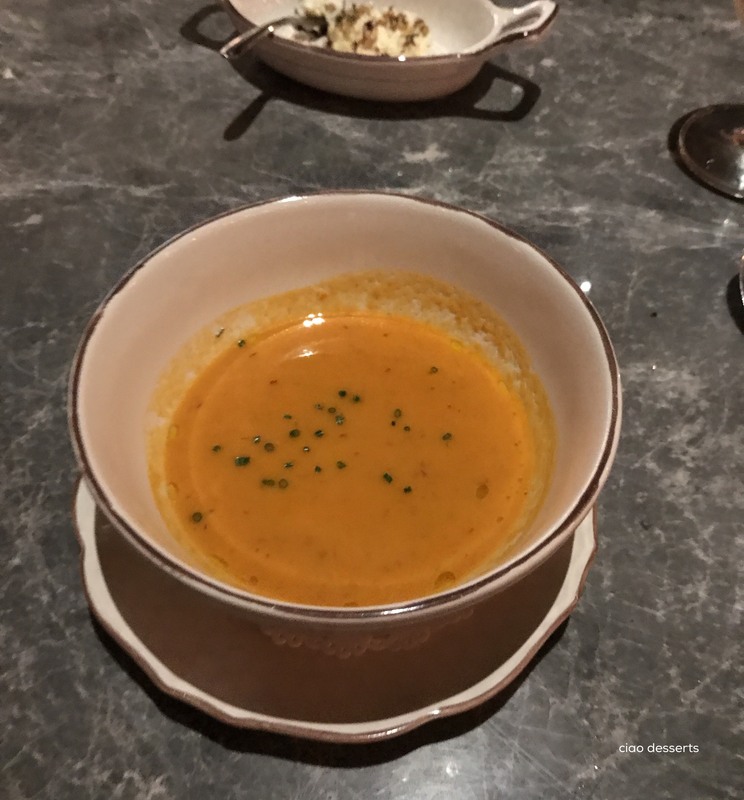 The soup was just the right balance of tangy and creamy. There were also a few chunks of their cured beef in the soup, but quite honestly, I think the soup would be better off without those chewy little bits. The portion size of the soup was perfect as an appetizer, but I think it should have been served in a smaller bowl. Next, our main dishes arrived. My friend chose the Beef Tendon Bolognese with Rigatoni (牛腱肉醬水管麵）and I risked a severe allergic reaction (to crab) for the Deep Fried Soft Shell Crab with Mafaldine Aglio E Peperoncino (酥炸軟殼蟹酸味辣椒麵）My rationale was if I was going to break out in a rash, it was best to do it with something truly delicious, and when I had three days to recover in the privacy of my home. 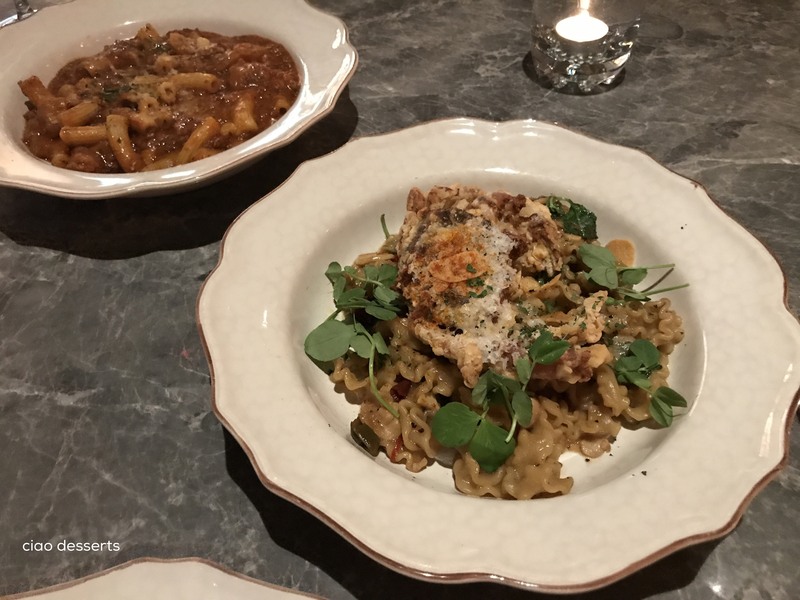 All the pastas at L’idiot are handmade~ which gave them a delightfully chewy texture. My pasta was not just ordinary spaghetti, but Malfada pasta, which is a thick, ribbon like pasta with ruffled edges, which captured the spicy sauce in each nook and cranny. The soft shell crab was also stuffed with an assortment of peppers, and it went well with the pasta and sauce. Both dishes were a bit on the salty side, but we barely noticed because our glasses were kept topped up with mineral and sparkling water. By the time I finished most of the noodles, I was full and headed towards a slightly woozy food coma. 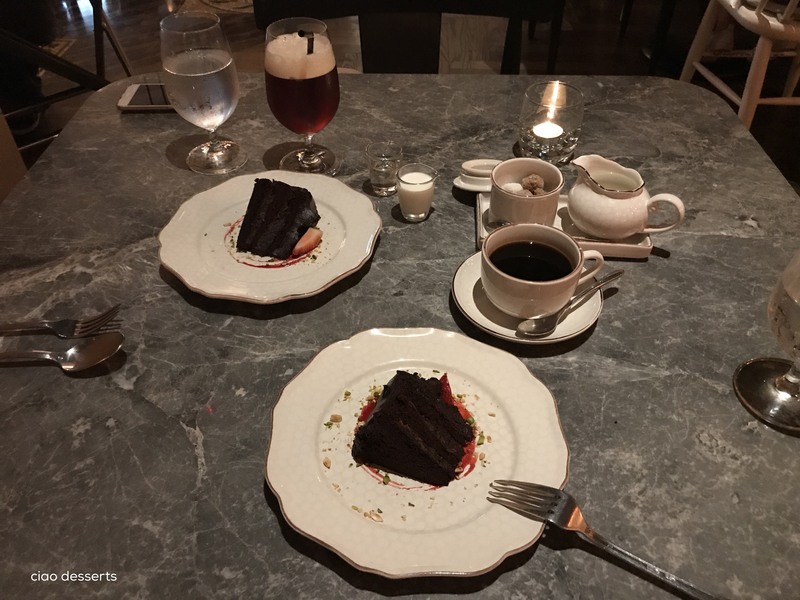 However, of course, I have a separate stomach for dessert~ and I was happy to discover that the dessert of the day was chocolate cake, with a decadent ganache frosting. The cake was dense and moist, and I thought a strong coffee was the best accompaniment. Afterwards, we sat and chatted in the pleasantly cool room, and just enjoyed the atmosphere of a busy, yet calm and efficiently run restaurant, where everyone also seemed to be enjoying every bite. Enjoy! (P.S. No rash from the crab yet! I may have outgrown the allergy~ I haven’t had crab since I was 10 years old… or I was just lucky this time. But for me the soft shell crab at L’idiot was worth the gamble). This entry was posted in Uncategorized and tagged chocolate cake, Pasta. Bookmark the permalink.